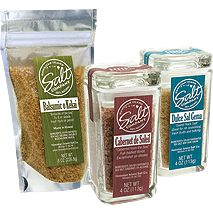 The Hawaiian Island Salt Company is a local, Oahu based, Hawaiian gourmet sea salt business. We work with one of the best Selmeliers (salt experts) in the world. Every whole salt product we sell is harvested using warm Hawaiian sun to separate the salt from the purest Pacific water in the world. Our White Sea Salt is the purest, most exquisite salt for cooking. The unique whole salt crystals add a distinctive consistency to finished food and the mineral rich flavor provides an island flair to most any dish. Check out our recipe section loaded with meal suggestions and cooking tips. Our infused salts are uniquely Hawaiian. The Black Lava salt, Hot Black Lava salt, Kiawe Smoked salt and our Red Alaea Sea Salts, known as "Pa'akia o ka 'Aina", borrow from earthly minerals making an even more healthful island blend. Used as much for their decorative qualities as for their taste, these whole sea salts will add a tasteful new range to your cooking repertoire. 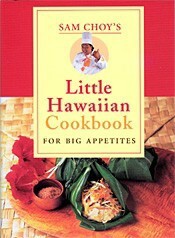 Our flavored salts are inspired by some of the best Hawaiian dishes, offered by local chefs for generations. 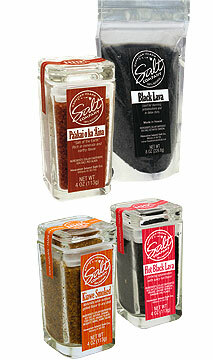 Each of our salt flavours were created to compliment specific foods and recipes. Once you've tried them you'll enjoy creating tantalizing original dishes of your own. 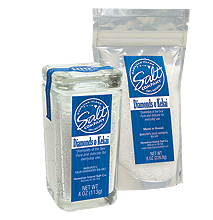 Hawaiian sea salts are a unique combination of taste, mineral content, intriguing varietals and affordability, making them hard to compete with and clearly incomparable. Our freshly harvested Pacific Ocean salt has no additives and nothing artificial. It is produced through the evaporation of ocean water. Depending on the water source, this leaves behind trace minerals and elements. The minerals add flavor and color to sea salt, which also comes in a variety of coarseness levels. Salt: Nutritional Friend or Foe? Acacia Wood Hawaii's finest wood products valued world-wide.